Ten-year-old Pearl Spence is a daydreamer, playing make-believe to escape life in Oklahoma's Dust Bowl in 1935. The Spences have their share of misfortune, but as the sheriff's family, they've got more than most in this dry, desolate place. They're who the town turns to when there's a crisis or a need―and during these desperate times, there are plenty of both, even if half the town stands empty as people have packed up and moved on. Pearl is proud of her loving, strong family, though she often wearies of tracking down her mentally impaired older sister or wrestling with her grandmother's unshakable belief in a God who Pearl just isn't sure she likes. Then a mysterious man bent on revenge tramps into her town of Red River. Eddie is dangerous and he seems fixated on Pearl. When he reveals why he's really there and shares a shocking secret involving the whole town, dust won't be the only thing darkening Pearl's world. While the tone is suspenseful and often poignant, the subtle humor of Pearl's voice keeps A Cup of Dust from becoming heavy-handed. Finkbeiner deftly paints a story of a family unit coming together despite fractures of distress threatening to pull them apart. Now that I am grown, I am a huge lover of history. I get so tired of reading modern day novels and enjoy reading fiction that lets me escape the real word for a little bit and takes me back to what seems like a gentler era. 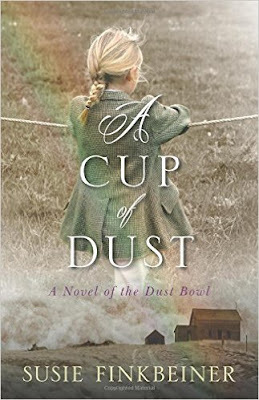 A Cup of Dust is not what you'd call a "pretty story". The setting of this novel is in the Oklahoma Panhandle during the Dust Bowl of the 1930s, it portrays in personal and excruciating detail the hardships of that time and that place. So, like I said... it's not a pretty story. But it's a WONDERFUL story. From the moment you "meet" 10-year-old Pearl, who is the daughter of the local sheriff, we see everything that happens through her eyes that don't miss a thing. Right alongside her, we learn about Hoovervilles and hoboes and FDR and jackrabbits. And dust. Oh, the dust. We see what people did when they were desperate with no food to feed their babies. This is a bold picture of a fallen world in need of a Savior. I really wanted to skip the parts of the story that were too violent, but I read them anyway.